The new Cat D6 XE dozer. Caterpillar will display 64 machines, 20 of them new introductions – the most new products Caterpillar has ever introduced at bauma Munich. The Caterpillar display will occupy more than 9,000 square metres in the main indoor exhibit in hall B6. Illustrating the depth of machine choices for customers who partner with Caterpillar are the new D6 models, available in a broad choice of configurations and updated technologies for next-level versatility and performance. The D6 XE is the world's first high-drive electric-drive dozer offering up to 35 percent better fuel efficiency than its D6T predecessor and the quick dirt-moving ability of constant power to the ground. The wheel loaders also illustrate Caterpillar choice – not only offering a wide selection of model sizes, but also giving customers a choice of drivetrain design. On display are the 950 GC, 950M, 962M waste handler, 986K and 992K, plus several XE models – 966M XE, 972M XE and 988K XE. The 988K XE is the company's first diesel/electric-drive loader, employing a durable switched-reluctance drive motor, generator, and inverter, coupled with a mechanical gear box and axles. The 988K XE lifts fuel efficiency and productivity to new levels. Choice continues with Cat Next Generation excavators – the new 330 GC, 330 and 336 will be showcased. The 330 and 336 are equipped with integrated Cat Connect Technology that can increase operating efficiency up to 45 percent, compared with conventional grading operations, and can enhance fuel efficiency as much as 20 percent, compared with predecessor models. Additional models on display include the 973K track loader; and 325F, 340F UHD (ultra-high-demolition configuration), and 390F excavators. Wheel excavators will be represented with the M314F, M315F, M317F and the M318F. Material handler models include the MH3024 and MH3026. The new 302 CR next generation mini excavator. Five new Cat Next Generation mini hydraulic excavators in the BCP lineup are on display – 301.5, 301.6, 301.7 CR, 301.8, 302 CR – designed to provide customers the best performance, versatility, safety, operator convenience, and affordability in the smallest possible packages for 1-to-2-ton-class machines. Industry-first standard features include joystick steering (stick steer) and a tilt-up canopy or cab, as well options such as air conditioning and expandable undercarriages. The Cat range of Next Generation mini excavators continues with three new models in the 7-to-10-ton category on display. The new models – 308 CR VAB, 309 CR, and 310 – provide a selection of basic configurations, allowing customers to choose the machine that works most efficiently in their applications, whether standard configuration, compact radius or variable-angle boom. Additional BCP machines on display include wheel-loader models – 907M, 908M, 918M with a waste configuration, 926M in an agricultural configuration, and the 938M; a backhoe loader (444); the 226D skid steer loader; 259D compact track loader; and TH408 telehandler. To ensure optimum efficiency, profitability, and machine protection, equipment owners must be able to monitor the location and performance of their machines – anytime, anywhere. The Caterpillar display at bauma Munich will emphasize this essential capability. Cat LINK technology provides equipment owners a choice of options that best fit individual needs and budgets, ranging from simple machine monitoring to full-fleet tracking and management. The Cat Product Link telematics system collects data from machine assets – any type, any brand – data including, for example, asset location, engine on/off, work hours, fuel burn, and diagnostic-code alerts. New is the introduction of PL161 to track operating hours and location of work tools (see work tools paragraph). This information is available to the owner via a secure website, Cat VisionLink, which conforms to ISO standards. Also, on display at bauma Munich will be recent examples of Caterpillar technology that further expand machine connectivity. The new, industry-first Cat App is designed to allow users remote access to telematics data – tracking machine hours, location, receiving diagnostic codes, and managing maintenance directly from their mobile phone without turning on their computer. With the operator ID feature, individual performance can be tracked and training opportunities identified. In addition, users can use their mobile phone as the digital key for starting select Next Generation Cat machines. Users can also find value in viewing telematics data and additional equipment management resources on the companion website: https://my.cat.com. 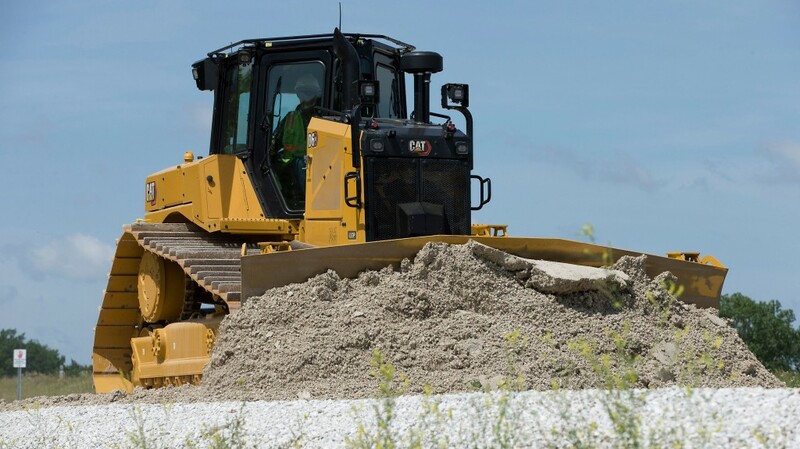 Also new is a suite of Cat Connect technologies that provides remote equipment diagnostics and software updates. Cat Remote Services includes two key offerings – Remote Troubleshoot (allows dealers to run diagnostic testing and pinpoint potential issues) and Remote Flash (allows dealers to remotely load current versions of on-board software). For users of off-highway trucks, on display at bauma Munich will be the 777G, a 100-ton (90 mt) hauler with a Cat C32 engine rated at 945 net horsepower (704 kW) with U.S. Tier 2 equivalent emissions. The new truck features a refined cab that positions the operator seat on the left side, along with a new console with an integrated hoist and shift lever. The new 777G provides customers a choice of bodies. The 60.1-cubic-metre dual-slope body is designed for maximum material retention on grades and has two side-board configurations available for light material, as well as a rubber liner. The X-body is designed with a flat floor to better meter material into a crusher and is available with either steel or rubber liners. Cat articulated trucks will be represented at bauma Munich by the completely redesigned 730, weighing 22 percent less than its predecessor, the 730C, yet retaining 98 percent of its predecessor's capacity. The new truck features automatic control of traction, dumping, and retarding, as well as the Caterpillar Stability Assist system. Caterpillar technology that keeps operators safe, comfortable and productive also will be on display at bauma Munich with the D8T dozer remote-control station. With multiple levels of remote control and even semi-autonomous operation, Cat Command for dozing is available in two configurations – an over-the-shoulder remote-control console or the remote-operator station. Operators have full control of the dozer without being exposed to job-site hazards. The XQP100 generator set can either meet EU Stage IIIA emission standards or provide low fuel-consumption performance for customers in non-regulated territories. With a robust rental- or mobile-ready construction, the product line is designed to be easily transported around project sites safely and efficiently. Heavy-duty bases with integrated fork lift pockets allow the unit to be easily dragged and lifted, while Clipsal or CEE socket options are available on select models to reduce installation time and to provide trouble-free power distribution. Caterpillar is expanding its excavator work tools with the new GC silenced hammers, the tiltrotator, as well as the MP332 (mounted on the 340F UHD) and MP345 demolition multi-processors. The new S3050 scrap shear will represent the range of Cat shears. Caterpillar is introducing the Cat Product Link Locator PL161 which tracks the operating hours and location of work tools. From mid-2019, PL161 will be standard on most Cat work tools on excavators from 11 tonnes. Cat Advansys is the next generation of Ground Engagement Tools for wheel loaders and excavators and features easy, hammer-less removal and installation, longer tip life, and better penetration for optimum fuel efficiency. A wide range of seven different tip options have been developed to offer the right choice of tips in every application, whether excellent penetration or high abrasion-resistant tips are required. Yellowmark, a Caterpillar brand, offers Cat equipment owners an alternative to Cat genuine and Cat reman parts that balance reliability and convenience at a lower cost. The Yellowmark offering now includes more than 6,000 repair and replacement parts, covering drivetrain, engines, hydraulics, ground engaging tools, and undercarriage for more than 500 Cat models. Yellowmark's capabilities will be on display at bauma Munich. Other highlights include Caterpillar services, such as flexible financing plans; extended-protection options from Cat Financial; Cat Certified Used; Cat Certified Rebuild equipment and Cat rental available through the Cat dealer network.